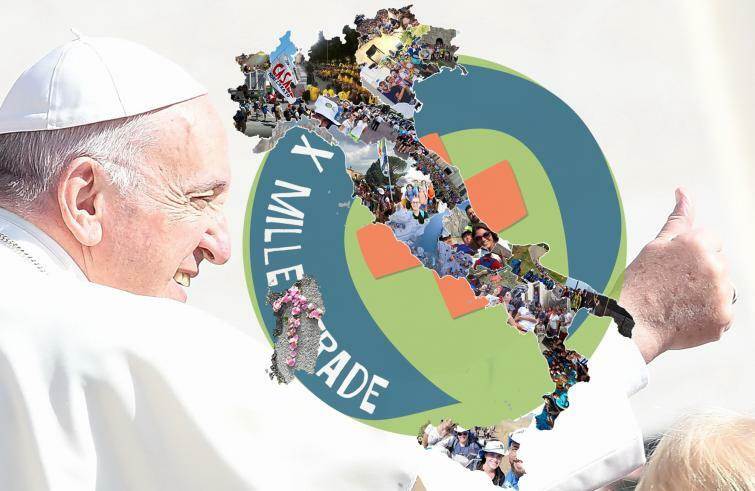 Francis met 60,000 young people who came to Rome for a gathering titled "Along a thousand roads," an event promoted by the Italian Bishops' Conference ahead of the Synod of Bishops on Youth. Rome (AsiaNews) – Pope Francis spoke to thousands of young people taking part in “Per mille strade” (Along a thousand roads), a prayer meeting promoted by the Catholic Bishops’ Conference of Italy in preparation of the Synod of Bishops next October. Some 60,000 to 70,000 young people joyfully invaded Rome’s Circus Maximus. The Holy Father mingled with them, answering questions from four of them, on the meaning of life, choices, the future, and love. "Dear young people,” Francis said, “you have in your heart the shining stars that are your dreams: they are your responsibility and your treasure. Make sure they are your future as well! This takes courage, against resistance and difficulties. Of course, dreams must be grown, purified, tested and shared. Have you ever wondered where your dreams come from? Are they born watching television? Listening to a friend? Daydreaming? Are they big or small dreams, miserable dreams that are satisfied with as little as possible? Dreams of comfort, dreams of well-being, of tranquillity. Dreams that put young people to sleep. Youth, without dreams, who retire. “The Bible tells us that big dreams are those that can be fruitful, sowing peace and brotherhood, like today. These dreams are big because they think of everyone with an US. [. . .] The opposite of me is us. True dreams are dreams about us. [. . .] Big dreams include, involve, are extroverted, share, generate new life. Big dreams, in order to remain so, need an inexhaustible source of hope, an Infinity which blows in and expands them. Big dreams need God in order not to become mirages or delusion of being all powerful. "Everyone's freedom is a great gift, which does not allow half measures,” Francis noted. “Love comes when it wants. Love is not a profession; love is life. This is why I ask parents to help love mature. In life love, true love, always comes first. [. . .] Love does not tolerate half measures. It must be sincere, open, courageous. At the end, the Bible says that God created them [humans] in his image and likeness and created them male and female. And what is the task of the wife, but to help her husband grow as a man and that of her husband is to help his wife grow as a woman." "The dreams of young people are a little scary to adults. Perhaps because they have stopped dreaming and taking risks; perhaps because your dreams undermine their choices of life. Dreams that lead to criticism. But let no one steal your dreams. [. ..] Look for good teachers who can help you understand them and make them real, gradually and peacefully. As for yourselves, be good teachers, teachers of hope and trust in the new generations coming up behind you. What you have received for free, put it back in circulation, return it enriched with your passion and intelligence. Settling down to comfort is a trap. Boys and girls, take a risk. Life is not a lottery in which only the lucky ones can realise their dreams. Life is a challenge in which you really win if you win together, if you do not crush others, if you do not exclude anyone." Finally, the Church "is not only the pope, the bishops, the priests, but all the baptised, and each one is invited to make it richer in love, more capable of communion, less attached to earthly things. If you, young people do not participate in the life of the Church, if you do not take up the message of the Gospel, the Church becomes poorer, loses vitality! The Church’s beauty and authenticity also depend on you. You do not lack the tools for listening and understanding the good words of the Gospel. It is certainly up to you to find the time, letting yourselves get involved in such wisdom, full of sweetness and light, but also the most subversive that exists. We can only believe by believing, just as we can only love by loving. “What is the secret? Prayer. It is the dialogue with the Father that gives breath to mind and heart. It is in prayer that your questions and pleas will find the right words to rise to heaven. Then, even faced with evil, pain and death, you will have the strength in the Holy Spirit to welcome the mystery of life and not lose hope.